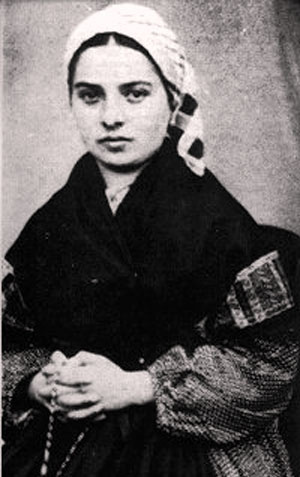 Bernadette Soubirous was only 14 years old when the Virgin Mary appeared to her. A series of 18 apparitions changed her life forever and made her the bearer of the message of Lourdes. Bernarde-Marie Soubirous was the daughter of François and Louise Soubirous and was born in Lourdes on the 7th of January 1844 at the Boly mill. Her relatives called her Bernadette. Her parents are not poor: her father is a miller and rents the mill where the family lives, the business is going well. She is the eldest of 9 children, of which only 4 survived infancy. Bernadette had a fragile health, and in November 1844, she had to go for care in Bartrès until 1846. She comes back to the mill. Her life is joyful, her parents are good pious people and generous with the poor persons. Later on, her life knows difficult moments with the loss of her little brothers and sisters and the severe injury of her father during the work during which he loses an eye. The "industrial revolution" takes over the rest. The mill doesn't bring enough money to pay the rent and the family is evicted in June 1854. François, Bernadette's father, rents a smaller mill, which costs less but is even less profitable. This is a new failure for the family. He becomes a labourer. Louise, the mother, starts working as a cleaning woman and Bernadette stays at home to take care of her brothers and sister. She doesn't go to school and speaks only the local dialect, Bigourdan. She doesn't either go to catechism and thus, cannot make her first holy communion. In 1854, Bernadette gets infected with cholera. She will survive but her health will remain very fragile. In February 1857, their cousin Sajous accepts to house the family for free in a room called "the Dungeon". It is a former prison cell. The whole 6 members of the family will use this one and only dark and dirty room as a sleeping room and kitchen. From September 1857 to January 1858, Bernadette goes back to her nanny's at Bartrès. There, she will take care of the household and will keep the sheep. She starts going to catechism and is happy to prepare her first holy communion. She joins her family in January 1858 at the dungeon. From January on, she goes to the hospice ran by the nuns (the Sisters of Charity of Nevers) which also offers schooling. She regularly goes with her sister and friends of her age to gather firewood to heat the freezing cold dungeon. Read the next article: the Virgin Mary's apparitions to Bernadette Soubirous and Bernadette's religious life in Nevers.